Find out how this franchising opportunity has successfully brought the unique snack combo from the streets to the cozy and air-conditioned premises of commercial malls. Mango-Ong’s chief executive also shares some personal insights on how entrepreneurs can be successful. 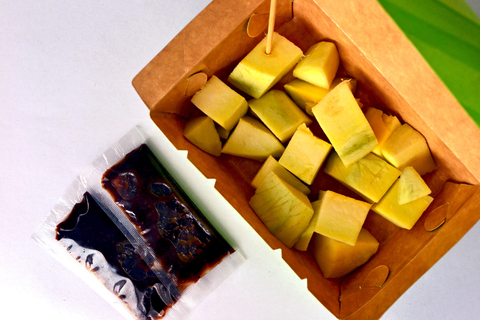 <>At one point in your life, you surely have indulged (out of craving or curiosity) in that quintessential Filipino street food treat, the 'mangga-at-bagoong' combo. 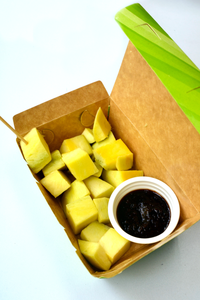 Simply imagining the crisp crunch of the green mango, complemented by the salty umami of the bagoong (native condiment made of fermented fish/shrimp and salt) can make anyone salivate for a bite. As a snack item, not much can get any simpler or cheaper than that; however, how can one enjoy it without experiencing the setbacks of the odoriferous after-effects of indulging in it? Jessie Cutillas, Chief Executive Officer of Mango-ong recounts how he and his business partners launched this best-selling street food into a mall staple by hurdling the crucial smell factor. “With the help of a good friend, I listened to his suggestion on how to get rid of the smell of bagoong. Just by doing that, we were able to enter the malls after persuading the operators that our products won’t smell or attract flies,” Cutillas recounted. By upgrading the humble product into a 'sosyal' snack, the upscale mall market started to embrace it, so much so that by early 2014, the company was able to open five more branches in different malls in quick succession. But why franchise with Mango-ong? Cutillas cites the business’ proven track record, having one of the lowest cash-out business opportunities and continuous support to franchisees via training in sales and marketing. “We offer reasonable packages, plus we conduct free monthly meetings and consultations,” he said. • Failure to pay close attention to business procedures: one incurs higher operating costs when he does not follow established steps in putting up a business. • Failure to monitor the staff: losses can be incurred by acts of pilferage, stock waste, and so on. • Failure to do the math: a basic understanding of how to compute for business returns can help the entrepreneur plan his business better. • Failure to take the initiative in improving the business: never rely solely on the franchisor to do everything for you. To make it easy for the first-time entrepreneur, Cutillas gave the following pointers for success. First, put God above all. Second, be open-minded and at the same time, be a good listener. “Attend seminars, trainings. Find time and make the effort to learn how to further improve your business,” he emphasized. He reminded that it was by listening that he found the secret to making Mango-ong stink-free and therefore, acceptable to majority of the mall market. Third, be a positive thinker. “But remember to always ground yourself in reality,” he said. Then, find a good supplier/contractor, who will play a big factor in making your business succeed. Lastly, remember that monitoring is important. “Write down your dreams and aspirations, and make a road map of what you want. Then go back to it to redirect your path, but never lose sight of your goal,” he advises. For franchise inquiries, check out the online directory listing of Mango-ong here.